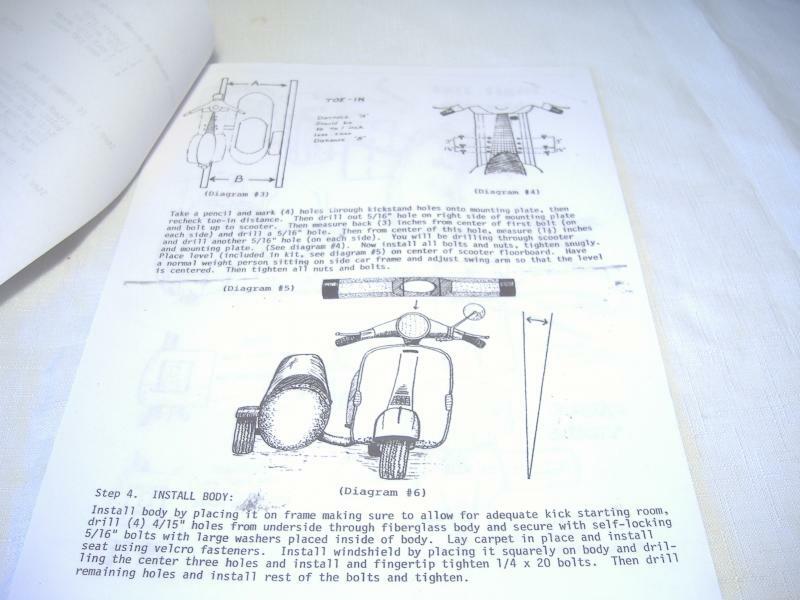 New in stock: Inder Sidecar Manual, Harley-Davidson Sidecar manual from 1936- 1979. 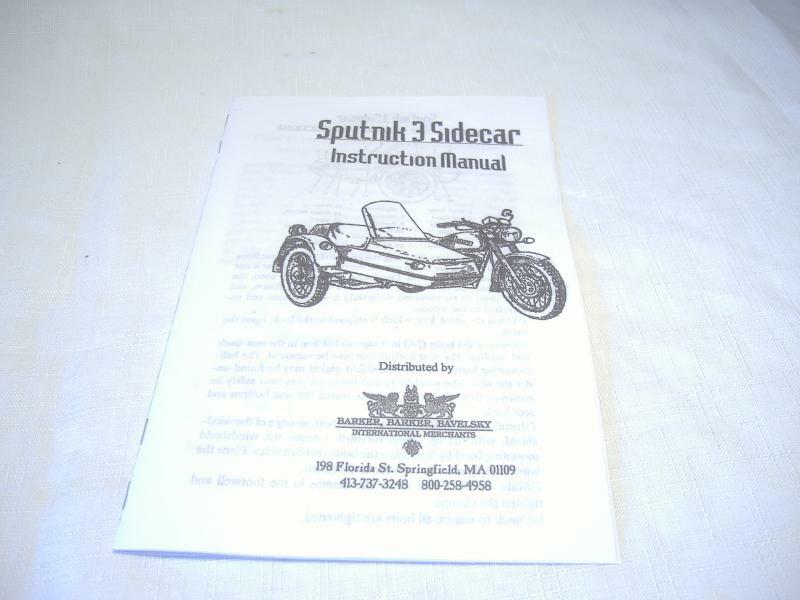 Sputnik 3 Sidecar owners manual. 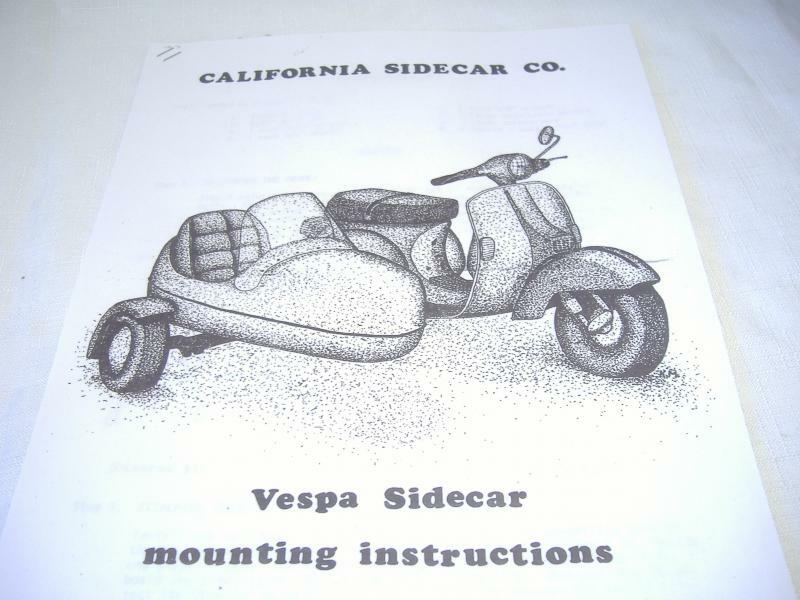 California Sidecar, Partner on Vespa Scooter owners manual. 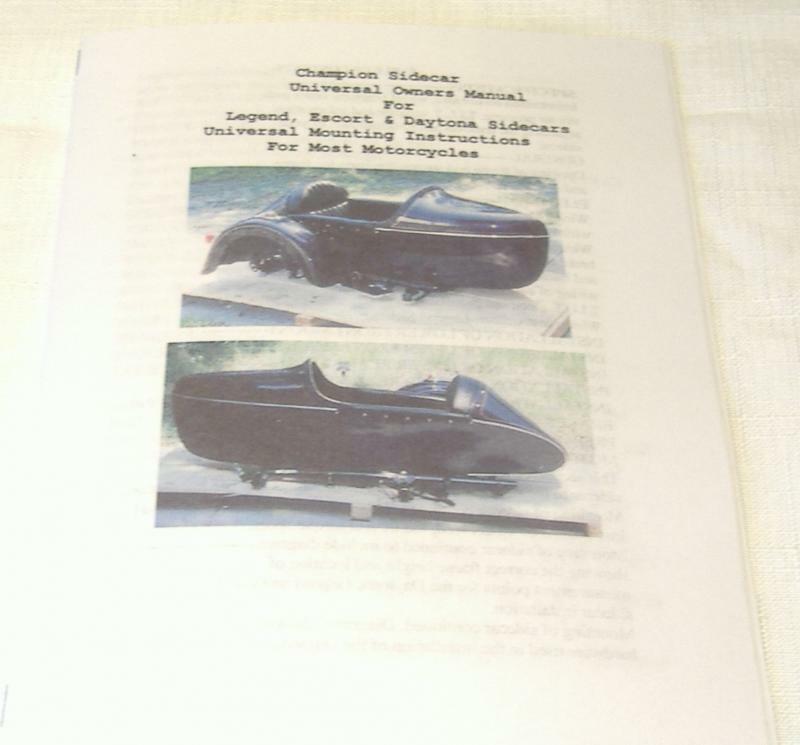 Velorex Sidecar Set up Manual For 562, 562E, 563, 565, 700 Models. PDF. 151 pages long. 560 JAWA / Velorex Sidecar owners manual in stock now. It is an e-book in PDF form and 108 pages long with 79 pictures and diagrams. It is a PDF I will e-mail it to you. California Sidecar Friendship III, FS II Owners Manual in Stock. New Equalean Sidecar Owners Manual in stock now. New Spirit of America, Spirit Eagle Sidecar Owners Manual in stock now. New American Easy Rider Sidecar Owners Manual in stock now. New Manual: How To Set-Up & Operate a Motorcycle Sidecar Outfit. New Hitchhiker Sidecar Owners Manual and New Parts Source List in Stock. New Champion Sidecar Owners Manual in stock now! Over the years I have collected many old sidecar owner/Instruction sidecar manuals. A few of them are,American Easy Rider Sidecar, Equalean sidecar, Hitchhiker Sidecar, Spirit Of America Sidecar, and California Sidecar. 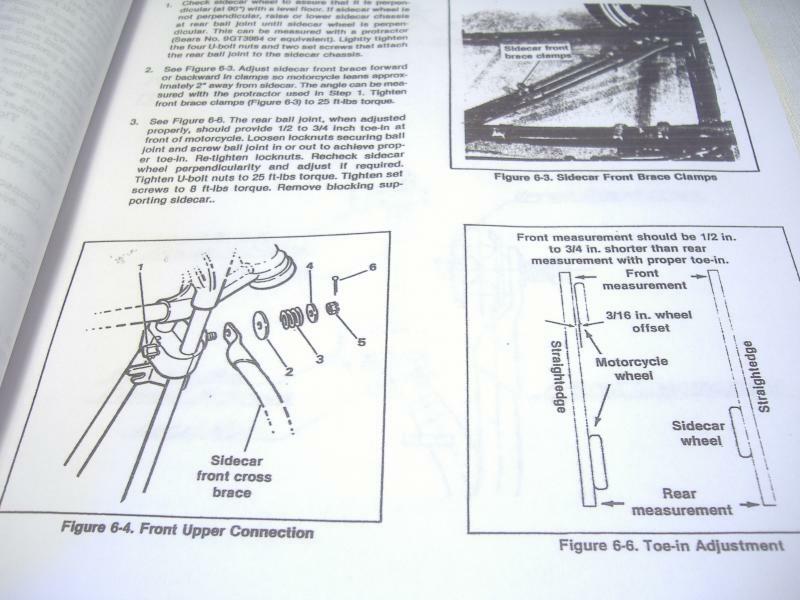 Most sidecar manuals tell you the basics like the measurements for toe in, lean out and wheel lead. 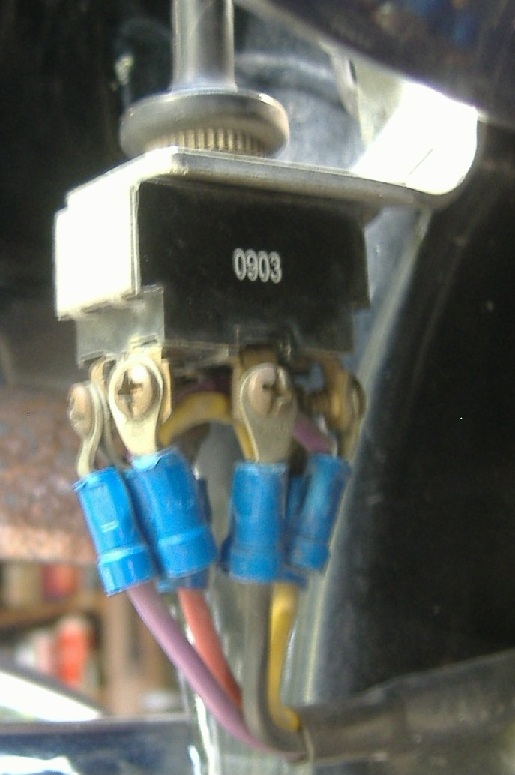 Also wire color code and some basic sidecar driving tips. I am looking for sales literature or sidecar manuals for the following sidecar models. Zephyr Sidecar, Sweet Sidecar, Gemini Sidecar. Payment: We do not have a shopping cart so please click on each PayPal button for multiple purchases. We take PayPal on our web site for secure purchase. No PayPal account is required. For checks and money orders, just send us a e-mail with your order and we will e-mail a invoice for you to mail your payment or give me a call. How to build a sidecar frame booklet with 34 illustrations. 30 pages long. See details on right. Instructions on how to attach a sidecar to a motorcycle. 36 pages with 18 pictures and illustrations. 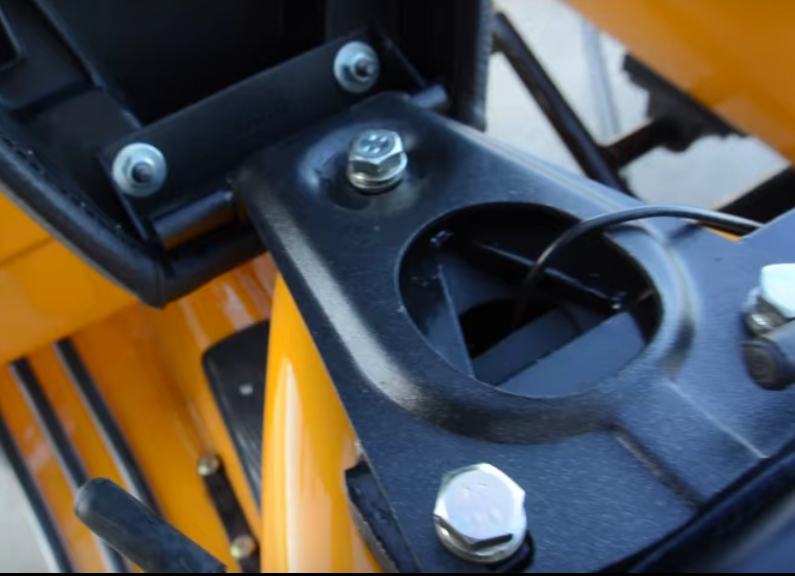 How and where to bolt the mounting hardware on to the motorcycle frame. Pictures of light weight sidecar mounting kit and heavy weight mounting kit. Set-up measurement specifications. How to set lean-out, wheel lead, and toe-in. Sidecar problems and solutions chart. Sidecar quick disconnect instructions. 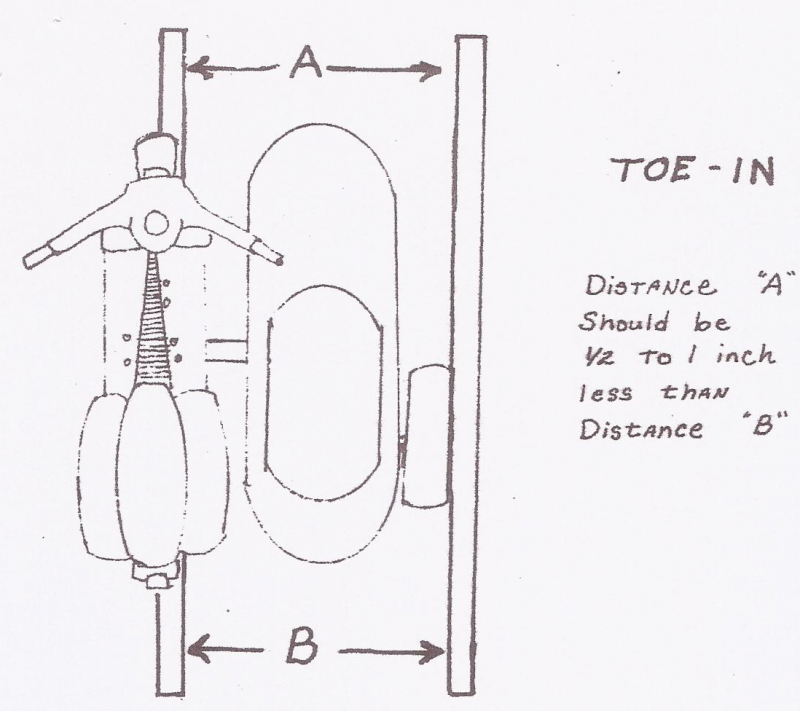 Explanation for the use of a steering damper, raked triple trees, and electric lean control. Section on how to drive/operate a sidecar for beginners. Sidecar part source index for mounts, subframe, brake quick disconnect, sidecar dolly, etc. California Sidecar Installation Instruction Manual For Pre 1989 Friendship & Companion Sidecars With Torsion Bar Suspension: Reproduction of original California Sidecar Installation Instructions. The diagrams originally had hand written notations that were not clear or legible, that has now been replaced with clear text. 28 page and 17 diagrams & pictures and a center spread illustration of frame, mounts, brackets, fasteners and parts. Light illustration with wiring color code. How to Up grade the mounts with modern parts and how to tweak your original clamps to work better and safer. How to rebuild your torsion bar suspension, and where to get a modern torsion bar kit to replace it. Where to buy a new windshield and how to make your own. What luggage racks will fit and where to buy them. Where to get a new seat cover, seat foam, seat shell. What modern fender will fit a Companion and where to buy it. Where to get a Tonneau cover made and how to make one yourself. Tail light lenses, Friendship : what motorcycle lens will work and how to make it fit. What LED light kit to use to replace the original 3 tail lights with. What to replace the Companion tail light with. And a index source list of new parts, bearing, bushing, seal, mounts, step, lights, torsion arm kit, etc,etc… and where to buy them. 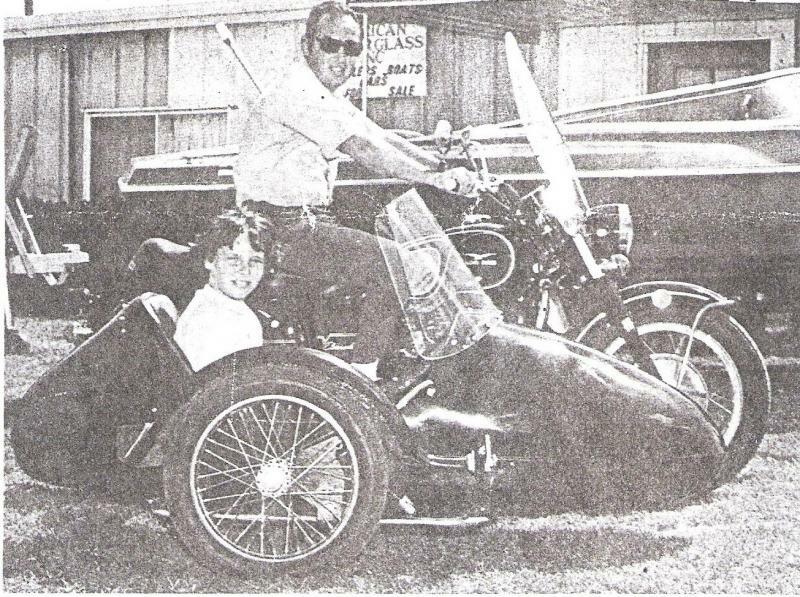 Some back ground biography on the sidecars and company and a interesting list of their early sidecar product line. Friendship III, FS II SE, FS II, FS I, Companion Sidecars. 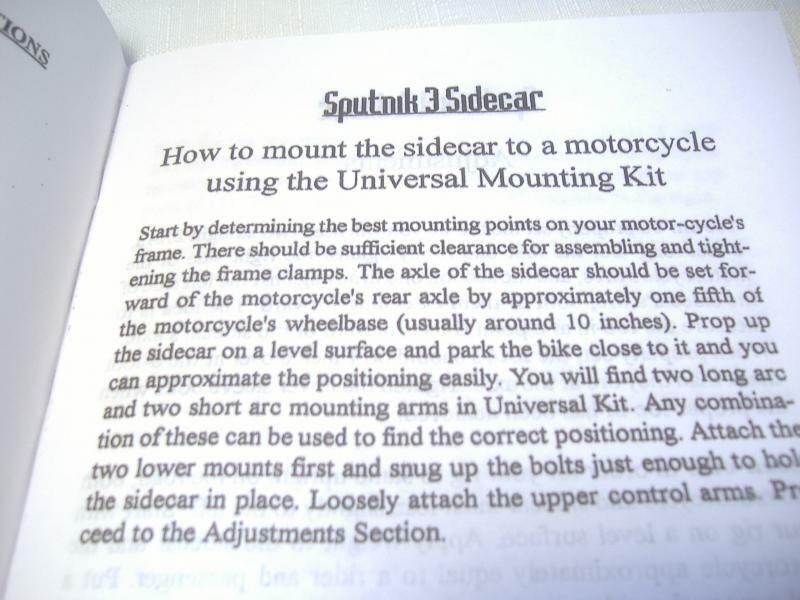 General Mounting Instructions For Most Motorcycles. Manual is 48 pages with 24 diagrams & pictures. Sidecar set-up instructions, measurements for wheel lead, lean out, toe in. Also has Commuter set up measurements. Wiring section with 3 wiring color codes and two diagrams for the various years and sidecar models. Explanation of raked triple trees and steering dampers and where to get them. 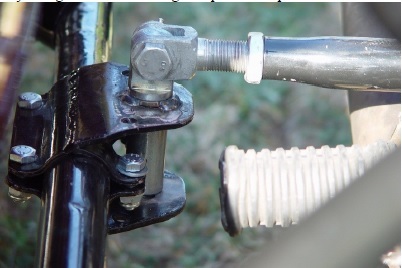 How to hook up a sidecar brake line to motorcycle brake. A brake part section on how to change brake pads, how to remove caliper, listing of aftermarket brake pad cross reference chart, caliper rebuild kit part numbers and where to buy them. Explains the difference between a Goldwing sidecar frame and a standard sidecar frame for the FS III & FS II SE. Sidecar handling problems and solutions chart. Swing arm and hub parts diagram. Lean Control Actuator troubleshooting and switch wiring diagram. Where to get a new Tonneau cover and Convertible Top made. Where to buy a new windshields, FS I, FS II and FS III. Tail light lenses, Friendship I & II: what motorcycle lens will work and how to make it fit. What LED light kit to use to replace the original 3 tail lights with. Where to get new and used FS III taillight old style and new style light. A back ground of the FS III with an early factory manufacturing flaw that needs to be adjusted for when it is set-up, and many more topics. Some back ground biography on the sidecar company. And a index source list of new parts, bearing, race, bushing, seal, mounts, sub frame, step, lights, brake parts & pads, foot rest, hardware, linear actuator and switch, rotor, hub, caliper, steering damper, shock, step, seat, OEM tire, raked trees, new windshields, air vents etc, etc… and where to buy them. 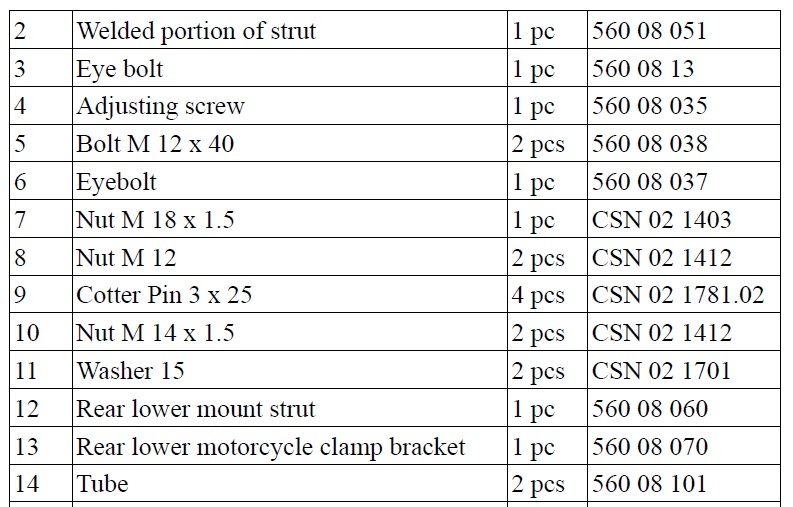 Plus a 6 page "Sidecar Parts List" with the CSC part numbers, see picture. This list is just for reference. Manual is also on our ''California Sidecar Parts" Page. 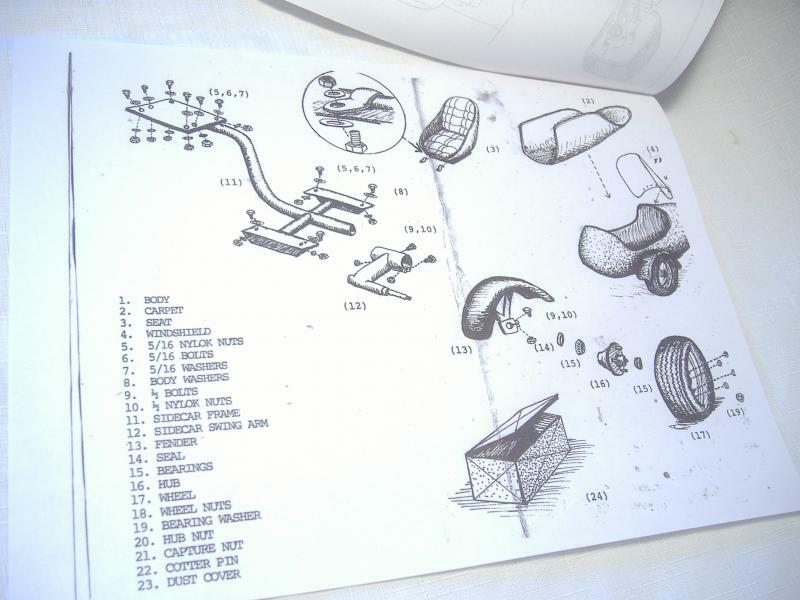 This is a photo copy of the OEM California Sidecar, Honda Goldwing 1500 mounting kit and sidecar set up instruction manual. Shows how to attach the CSC subframe mounting kit to GL 1500 and set up the Friendship III Sidecar. Also has the set up measurements to set up the FS I, FS II SE and Companion GT sidecars. Shows how to install the steering damper and has the wire diagram. Copy does have hand writing and grease smuges on it, see pictures. 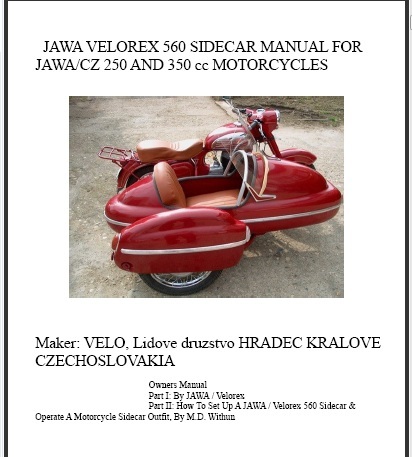 Velorex Sidecar: How To Set Up & Operate A Velorex Sidecar Outfit, Manual For 562, 562E, 563, 565, 700 Models. PDF. 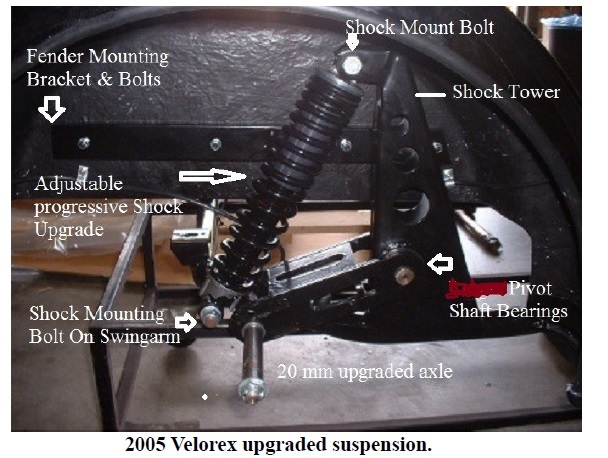 How To Set-Up & Operate A Velorex Sidecar Outfit: 562, 562E, 563, 565, 700 models. PDF on CD with 117 pictures, diagrams and 151 pages long. You will need a PDF reader to view it. I can e-mail the PDF to you. Part I: is a reprint of the original 560 Velorex JAWA Sidecar owners manual to mount the 560 on the JAWA 250 & 350 cc motorcycles. Part supplier list: 560 Sidecar source list of where to buy new 560 parts in Europe. This manual is 108 pages long and is a PDF file on CD. You will need a PDF viewer to read it. e-mail me for world wide shipping costor I can e-mail the PDF to you. California Sidecar, Partner Sidecar mounting instructions for a old Vespa P200 scooter. 4 pages with 7 diagrams. 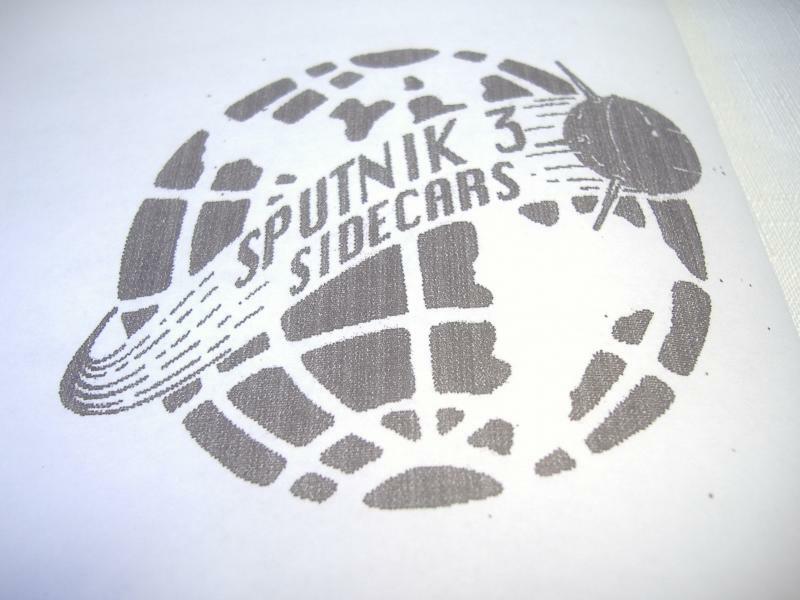 Sputnik 3 Sidecar set up instruction manual.8 page manual with 8 diagrams. 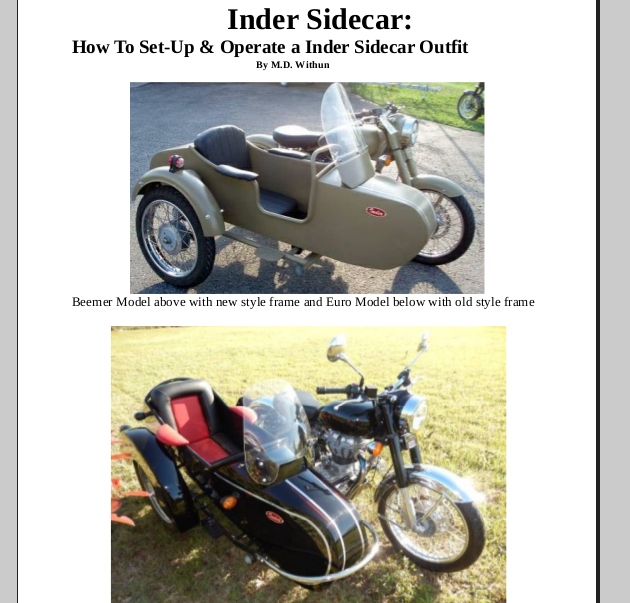 Inder Sidecar Manual: How To Set Up & Operate A Inder Sidecar Outfitl. Shows how to set up the Beemer, Rocket, Euro and Royal Retro, sidecar wheel lead, lean-out and toe-in. 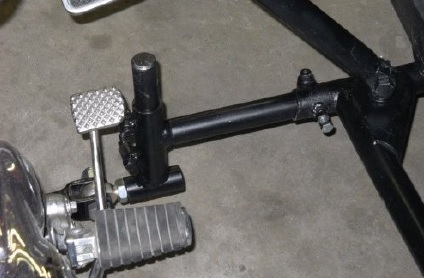 Section on Royal Enfield sidecar attachment. 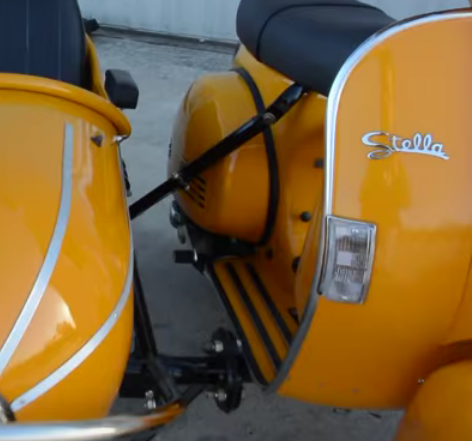 Has a section on the Sport Retro Sidecar set up on a scooter. 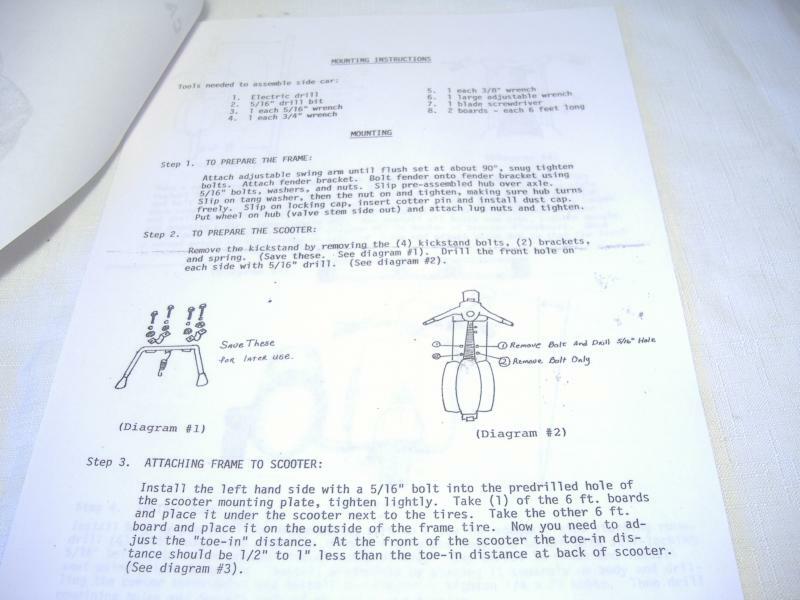 Manual shows right hand sidecar mounting. Specifications will also work on left hand sidecar mounting. Section on how to drive a Inder Sidecar and much more. Has 124 pages, many pictures and diagrams and is a PDF on CD. You will need a PDF viewer to read the manual. e-mail me for world wide shipping cost or I can e-mail the PDF to you. I would call this a Harley-Davidson OEM mounting kit instruction manual and sidecar set up manual for 1936 to 1979 models. It is 8 pages long with 10 diagrams. 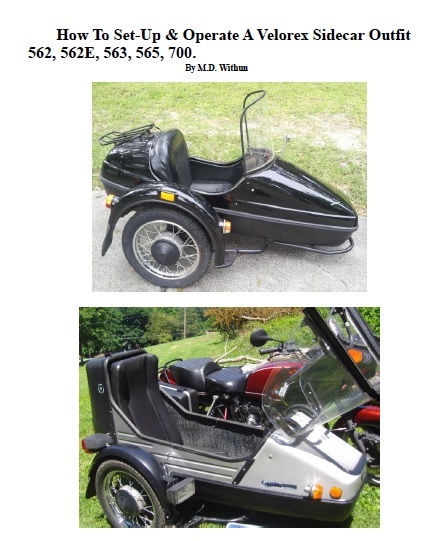 28 page Spirit of America: Spirit Eagle Sidecar owners manual. 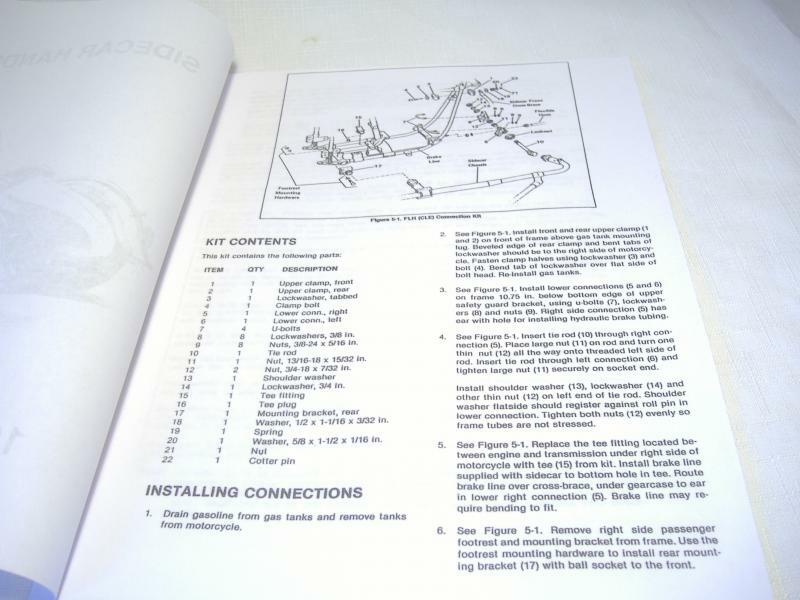 Part I is a reprint of original sidecar installation instructions and tells how to assemble sidecar and shows the measurements and diagrams to set wheel lead, toe-in and lean-out. Tells you where to get custom Eagle mounts made. How to upgrade any Eagle frame to use new modern sidecar mounts and tells you where to get them and how to make your own new modern sidecar mounts. Where to get your swingarm reworked to use a new axle & wheel. Where to get new wheel bearings and seals for swingarm and hub. Where to get a long lasting specially made 16'' sidecar tire for the Eagle. Windshield: Where to get a new Eagle and American Spirit windshield. Where to get a new OEM taillight. Seat: where to get a new one. Where to have a new tonneau cover made, and how to make one yourself. Where to get a subframe for your motorcycle to attach your Eagle sidecar to. How to find a sidecar rigger in your area to set up your Eagle or American Spirit Sidecar outfit and make custom mounts. Sidecar Part Source Index: where to find parts, I-bolts, struts, hardware, lights, rear view mirror, air vent, etc. 44 page Hitchhiker owners manual. 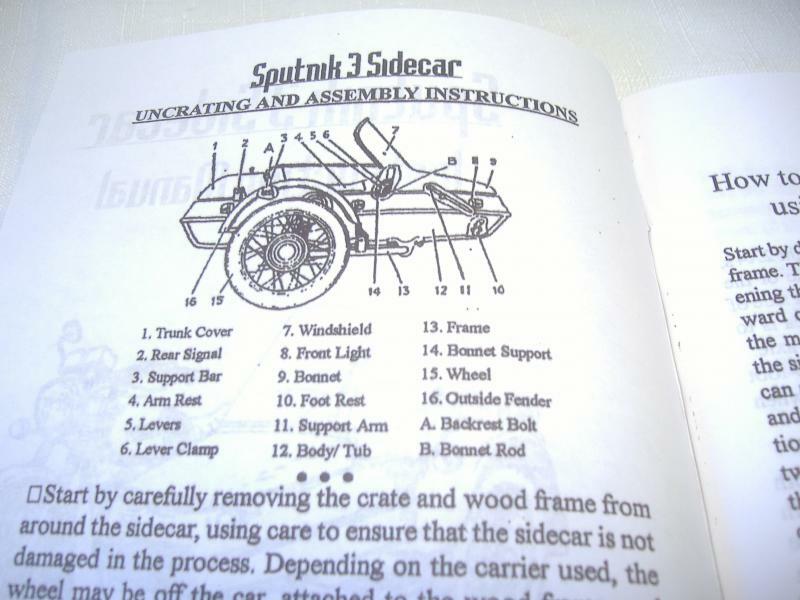 Part I is a reprint of original sidecar installation instructions and tells how to assemble sidecar and shows the measurements and diagrams to set wheel lead, toe-in and lean-out. The diagrams had hand written notations that were not clear and legible, they have been replaced with text. Tells you where to get custom Hitchhiker mounts made. How to make new Hitchhiker mounts. How to upgrade any Hitchhiker frame to use new modern sidecar mounts and tells you where to get them and how to make your own new modern sidecar mounts. Where to get your swingarm reworked to use a new axle, hub and brake. What Rubber Torsion Arm Suspension with axle and hub to use to replace the torsion suspension on 1992 and later Hitchhiker frames and where to get one. Windshield: Where to get your Hitchhiker windshield reproduced. And how to make and cut a custom windshield. The right material to use to make one and how to bend it. Seat: how to make one and where to buy one. 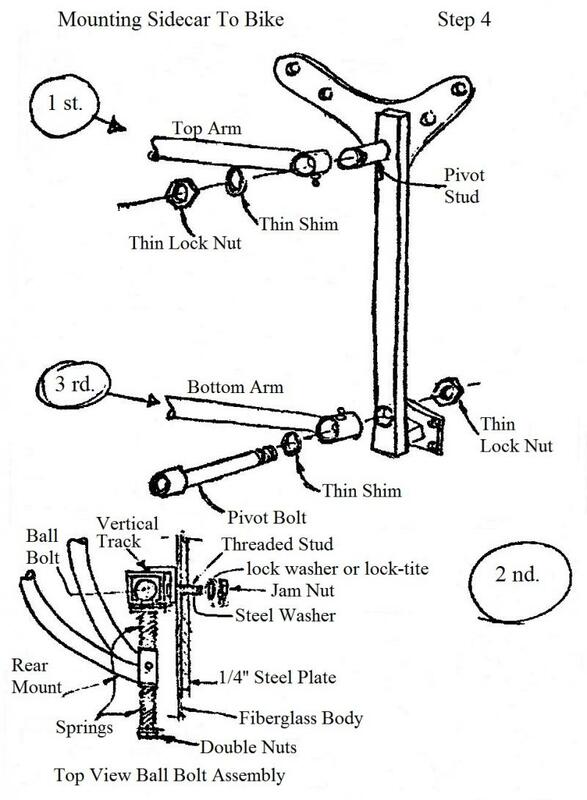 Wiring diagram for the Hitchhiker E-Z Lean System ( lean control ), and where to get a new switch and actuator ( electric screw jack ). Where to have a new tonneau cover and convertible top made. 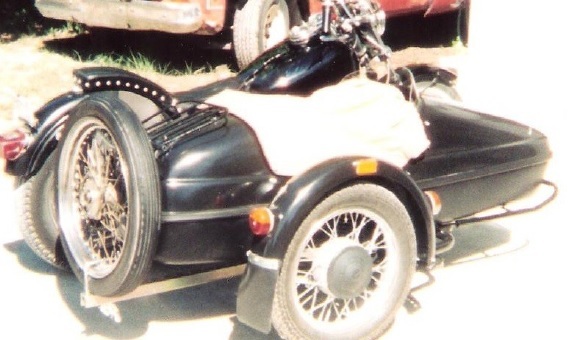 How to find a sidecar rigger in your area to set up your Hitchhiker Sidecar outfit and make custom mounts. Sidecar Part Source Index: where to find parts, I-bolts, struts, hardware, lights, molding, rear view mirror, trunk lock, air vent, electronic isolator to power sidecar and trailer lights, etc. Short biography of chain of ownership of Hitchhiker Sidecar company from its beginning in Minnesota to its end with its fourth owner in 2001 at a motorcycle repair shop in Crescent Springs, Kentucky. Electronic Isolator to run the sidecar lights and accessories. Brake parts, pads and proportioning valve, Bearings and Races, Footrest, Sidecar Mounts, Subframe, Hardware, Rotor & Hub, Floor Air Vent, T.I.L.T. Switch, Sidecar Rear View Mirror, Heater, etc. Very useful manual to have if your mounting a Champion Sidecar. If you already have a Champion Sidecar attached to your motorcycle you will find this manual useful to keep the sidecar mounts in proper adjustment and for the wiring color code and diagram, brake section and aftermarket part source suppliers list. Manual has 30 pages and 11 Illustrations and 12 Pictures. 32 page American Easy Rider Sidecar owners manual. 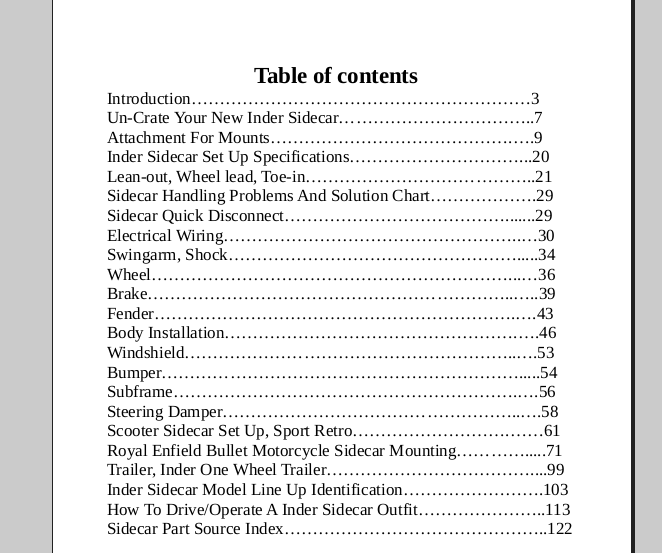 Part I is a reprint of original Principles Of Sidecar Rigging. 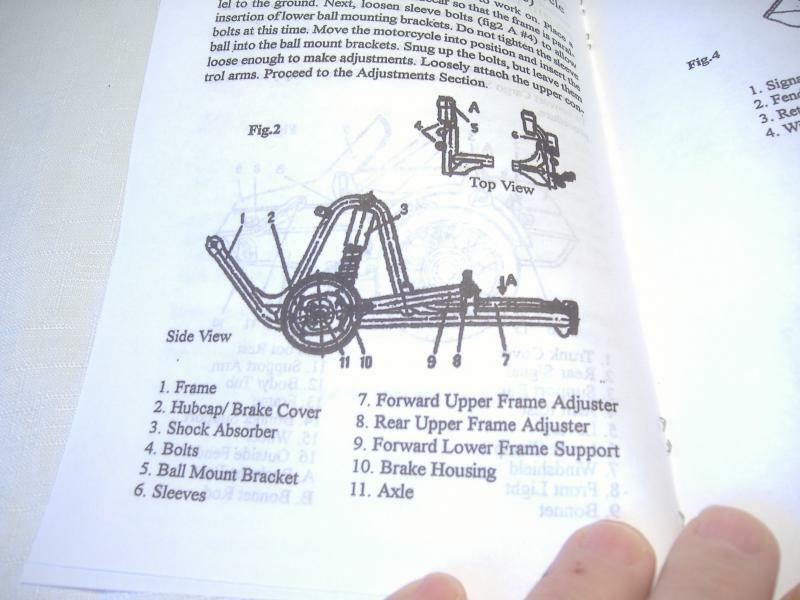 Part II is a reprint of the original American Easy Rider Sidecar Owners Manual with sidecar installation instructions and tells how to assemble sidecar and shows the measurements and diagrams to set wheel lead, toe-in and lean-out. Tells you where to get custom Easy Rider Sidecar mounts made. How to upgrade any Easy Rider Sidecar frame to use new modern sidecar mounts and tells you where to get them and how to make your own new modern sidecar mounts. Where to get your swingarm reworked to use a new axle. Windshield: Where to get a new Easy Rider Sidecar windshield. Where to get a subframe for your motorcycle to attach your Easy Rider sidecar to. How to find a sidecar rigger in your area to set up your Easy Rider Sidecar outfit and make custom mounts. Sidecar Part Source Index: where to find parts, I-bolts, struts, hardware, lights, rear view mirror, air vent, electronic isolator to power sidecar and trailer lights, etc. 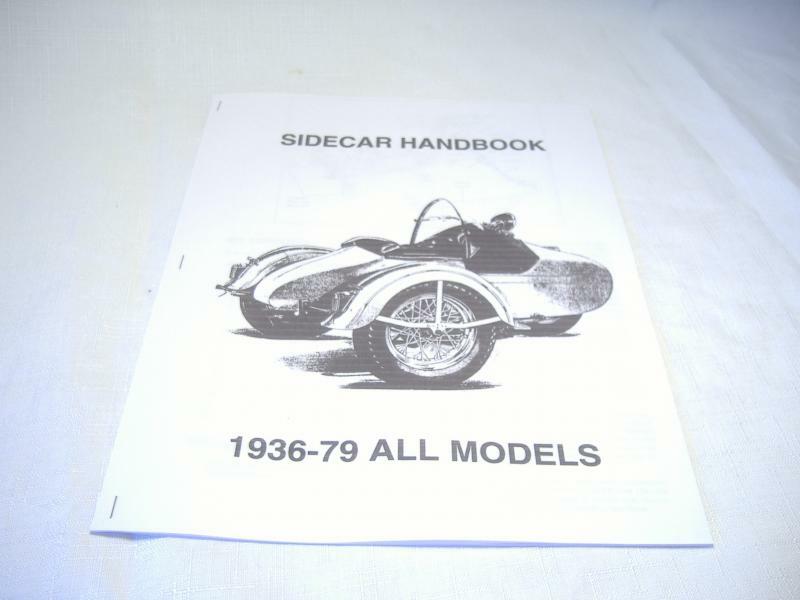 Paper reprint of the OEM Vetter / Terraplane Sidecar Driver's / Owner's Manual. 11 pages long with 13 diagram's. Just general information on putting the sidecar together. Does not show how to mount it to a motorcycle. This is a reprint of the original Equalean Sidecar owners manual (the leaning sidecar). It is for a Honda Goldwing GL 1000. The hand writing on the drawings have been replaced with easy to read text. 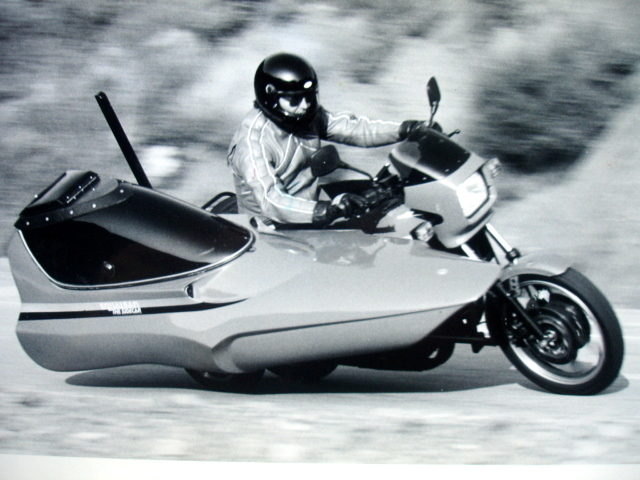 Part II is a reprint of the Equalean Sidecar sales brochure. Manual is 20 pages long with 4 detailed drawing of mounts and a few other interesting drawings and a picture of the short Equalean Sidecar model. Scooter sidecar set up manual. 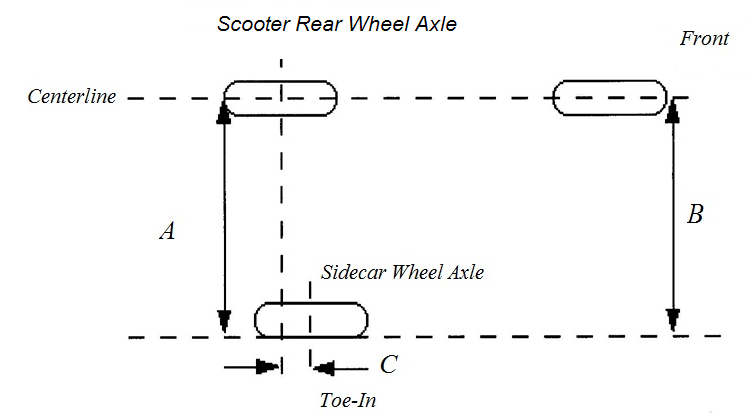 Instructions show the two ways sidecars are mounted on scooters. 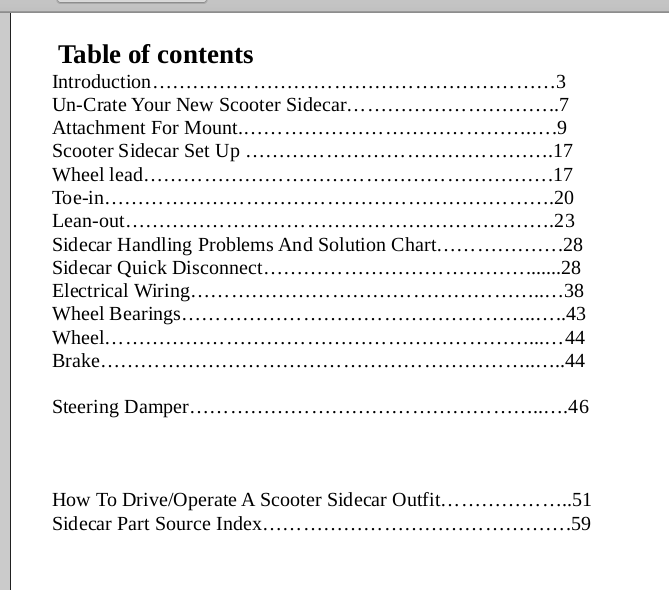 And a section on How to operate a sidecar outfit. 60 pages long with 50 pictures and diagrams. 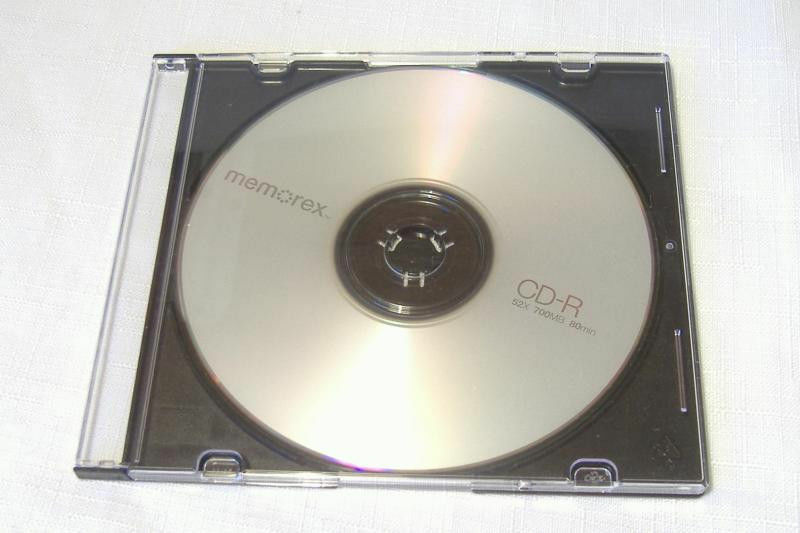 Manual is a PDF on CD. You will need a PDF viewer to read it. Free shipping in the USD. e-mail me for world wide shipping cost or I can e-mail it to you. Please check out our Sidecar t-shirt "the flying chair" and tell the world who you are on the inside. How to build a motorcycle sidecar frame. 30 page booklet with step by step instructions and detailed measurements and type of metal tubing to use. What kind of Shock to use and where to get it. What Axle, Hub and Wheel to use and where to get it. Use a Rubber Torsion Arm Suspension with axle and hub in place of swingarm and shock and where to get one. How to Build Mounts and/or where to buy them. Build a Trailer Hitch into your frame. Sidecar Body measurement specification guidelines and types of plywood to use that will bend around a curve for a home made body. 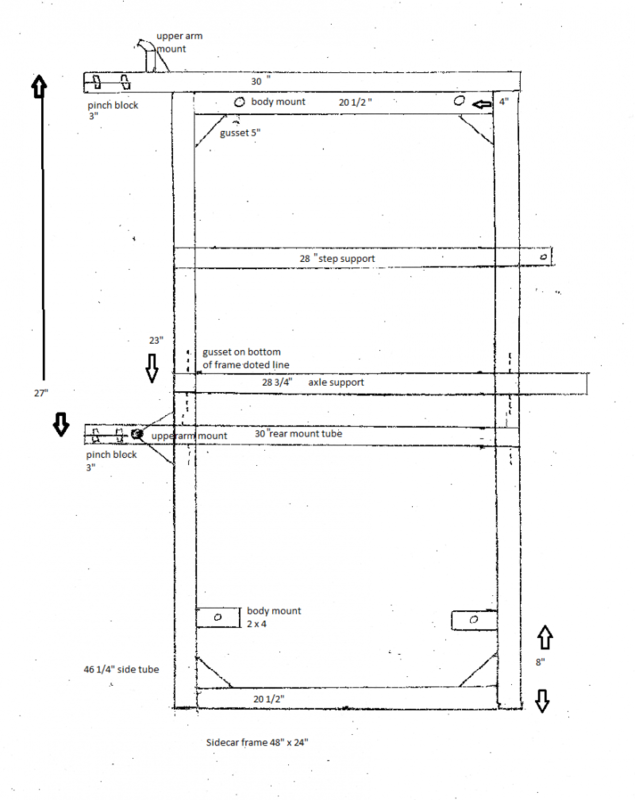 Specifications for the proper gauge steel or aluminum to use for body. Illustrations of some sidecar body styles that do not require any panels to be bent and some that plywood can be curved around. Windshield: How to make and cut a custom windshield. The right material to use to make one and how to bend it. Or where to buy a new sidecar windshield with over 30 to chose from. Accessories you may want to build into sidecar body: sidecar dash, lights, heater, vent, auxiliary fuel tank, lean control, 12 volt outlet and 110 volt inverter/outlet, battery isolator to run a motorcycle battery and a car battery on your outfit. Sidecar Part Source Index: where to find parts. Copyright F.S.P. All rights reserved.